← In a Vase on Monday. Fanny. February is the month when those of us in the clutches of White Fever lose all control to the bemusement of garden bloggers who are immune or who have not yet succumbed. 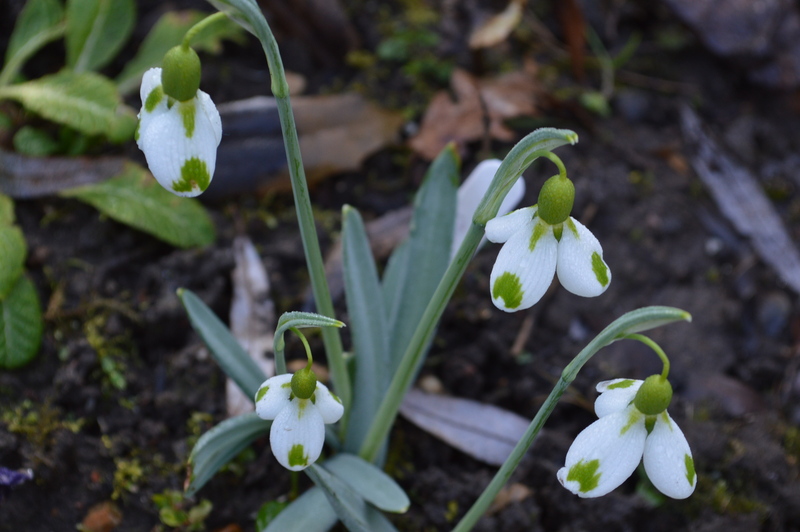 I say ‘not yet’ and I always read with amusement when someone writes that they have for the first time, acquired a different snowdrop, perhaps a Greatorex double or the reliable ‘S.Arnott’. If that is you, then be warned my friend, you are on the primrose path ( or should that be the ‘snowdrop’ path) to financial ruin and an annual month or two of insanity. Fortunately, the disease goes into remission sometime in March. But in the meantime your credit card can take some punishment. I try to resist the ones that are silly prices, and some of them are very silly indeed. In 2015 someone payed £1,390 on eBay for Galanthus plicatus ‘Golden Fleece’. You don’t need to pay this much for a yellow snowdrop. Lovely ‘Wendy’s Gold’ is quite reasonable. ‘Madelaine’ has yellow ovaries and clumps up quickly and makes quite an impact. Sometimes I pay, (shush, I’ll whisper it) -£20 and more, for something really different. I tell myself that I will twinscale it or grow it on and make lots of money selling it on eBay where people pay crazy sums of money for snowdrops. But I never do, I want nice big clumps myself and now and then it’s nice to have enough to share with friends. Anyway what sort of philistine looks at their snowdrops and sees money? Digggory was one of my expensive ones but who can resist those lovely puffy, seersucker flowers? 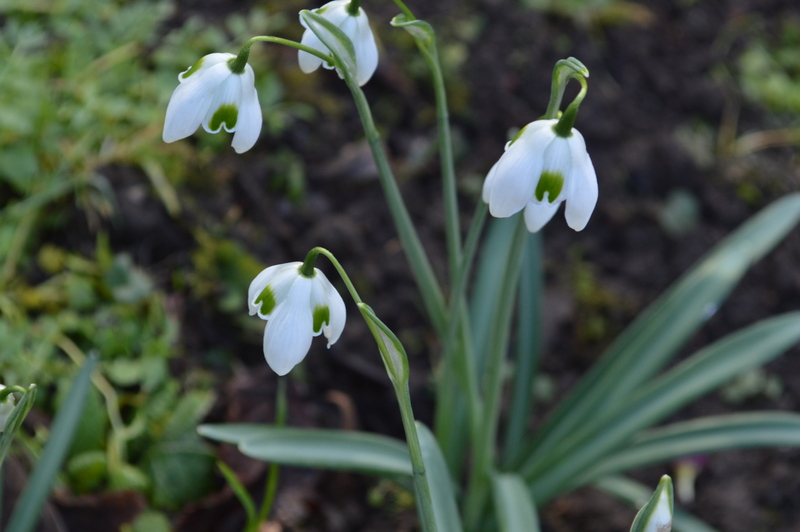 And even grumpy old Reginald Farrer called Galanthus poculiformis his ‘jewel of jewels’ because of its serene beauty. It has no green marks at all and the inner segments are the same size as the outer ones. 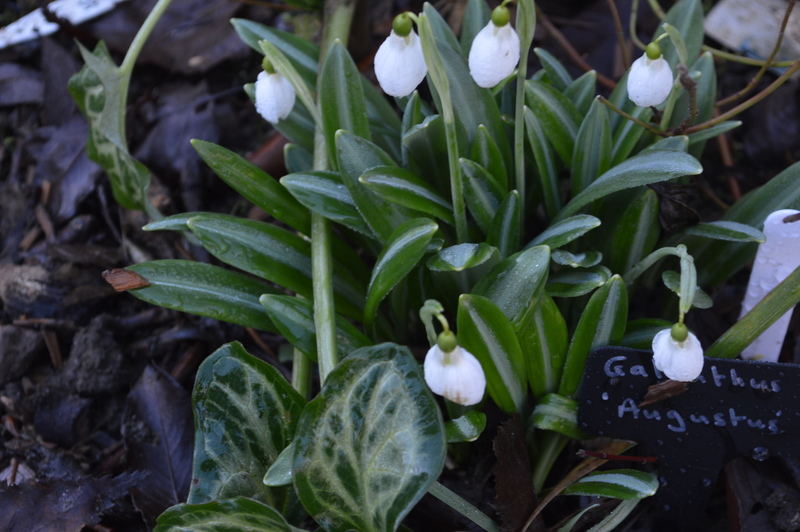 Or maybe the double ones are more to your taste, ‘Lady Beatrix Stanley’ has a froufrou skirt like a ballerina and the Greatorex doubles which were created by crossing Galanthus nivalis with Galanthus plicatus are all gorgeous too. Some of them have very pronounced green stripes like ‘Dionysius’ which is one of the first Greatorex doubles to bloom in my garden. I have all the Shakespearian heroines but ‘Titania’ is my favourite and so she should be as she is the Queen of the Fairies. Here she is still in bud. Galanthus nivalis is the snowdrop which carpets country churchyards and is so ubiquitous that many people believe it to be native although it is not. It doesn’t usually show much variation although I found this one with pale green shading on the outer petals recently. 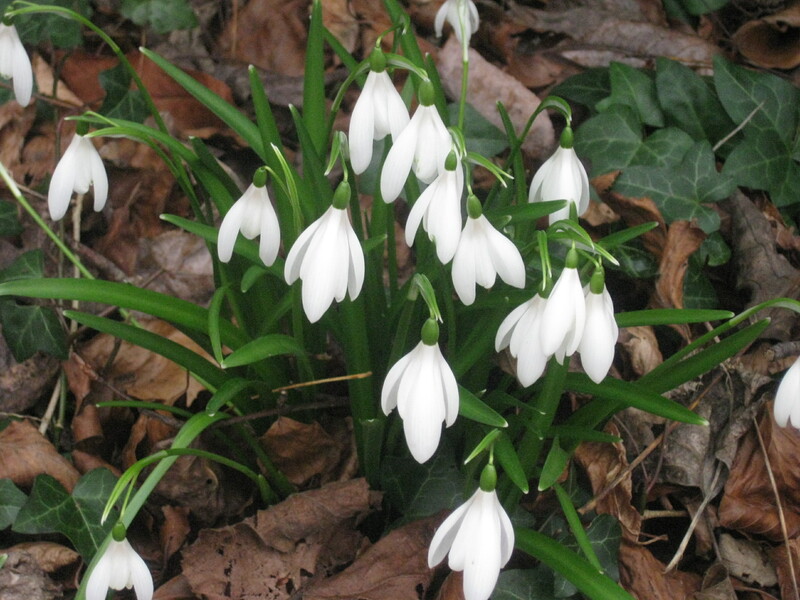 Snowdrops with green on the outer petals are very desirable. I have ‘Trumps’ who is so much prettier and nicer than his near namesake and here is ‘Trymlet’ struggling through the heather, I must move her to a more prominent position. And I am also very fond of dainty ‘Corrin’. 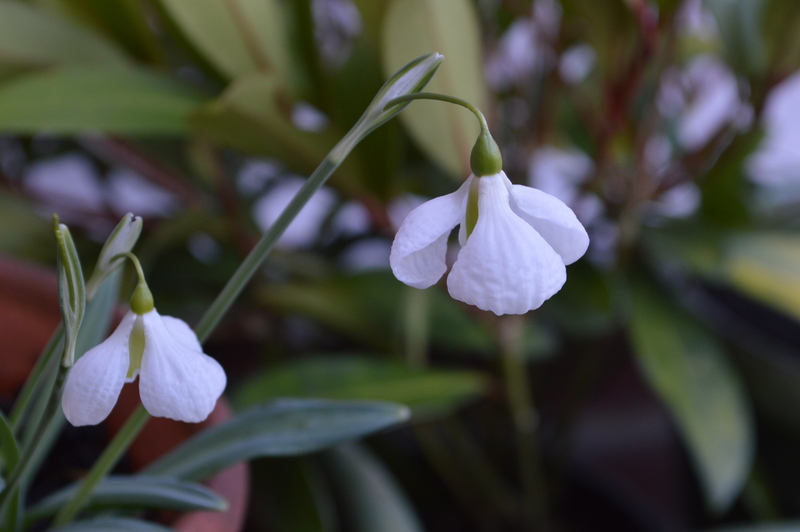 Maybe if I plant my snowdrop with the pale green shadings on the petals nearby I will get some unusual babies. And of course there is always the excitement when looking at snowdrops en masse that if you are sharp-eyed you might find something very different. And yesterday in the churchyard that is just what happened- I found this strange flower. And yes, I hear you gasp in horror, but I did dug it up. It was in danger of being squashed by careless workers who are digging trenches as some local busybody has decided our fifteenth century church needs a lavatory. Actually the oldest part is thirteenth century. I don’t know if modern bladders are weaker than they have been for the last 800 years or so, but they are making a terrible and in most people’s opinion, unnecessary mess. Anyway since the lead was stolen from the church roof we have CCT cameras so I will probably be arrested. I hope some of my blogging friends will visit me in jail. Personally, I think they should arrest the trench diggers. Galanthus elwesii is usually in bloom much earlier and has larger flowers. It has broad glaucous leaves and the flowers show lots of variations. Galanthus plicatus has distinctive leaves with a pleat in them. One of the most popular is the dumpy little ‘Augustus’ named after A. E. Bowles. 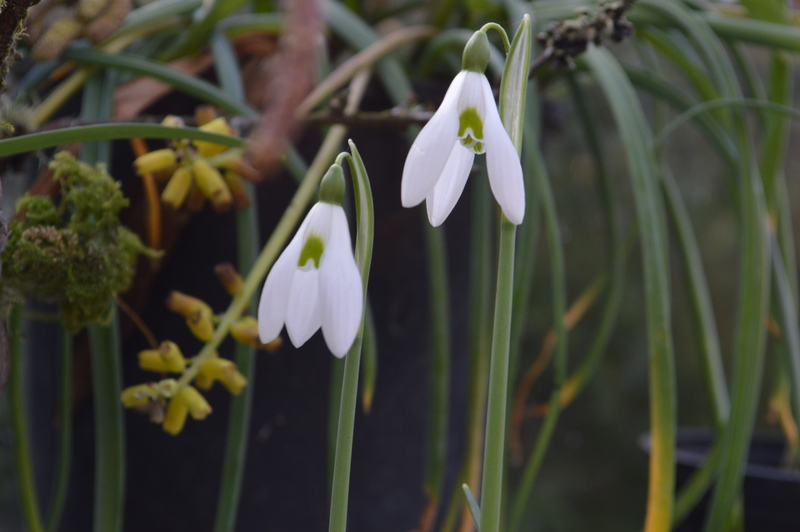 I have a lovely late flowering Galanthus plicatus with large folded leaves and flowers which grew in profusion in my old garden. It blooms in March and finishes off the the snowdrop season for me. And then of course there are the fragrant ones which smell distinctly of honey. I wrote about the lovely fragrance of ‘S.Arnott’ and ‘Brenda Troyle’ in a previous post but did I mention that ‘Ginn’s Imperatii’ smells of almonds? And ‘Brabaham’s Scented’ is the most sweetly scented of all. I keep a pot in the greenhouse. Behind it Muscari macrocarpum ‘Golden Fragrance’ is also pumping out a heavenly perfume. And then there are the ones with faces. ‘Grumpy’ looks exactly like a grumpy face. So there we are, for a few weeks I live and breathe snowdrops. 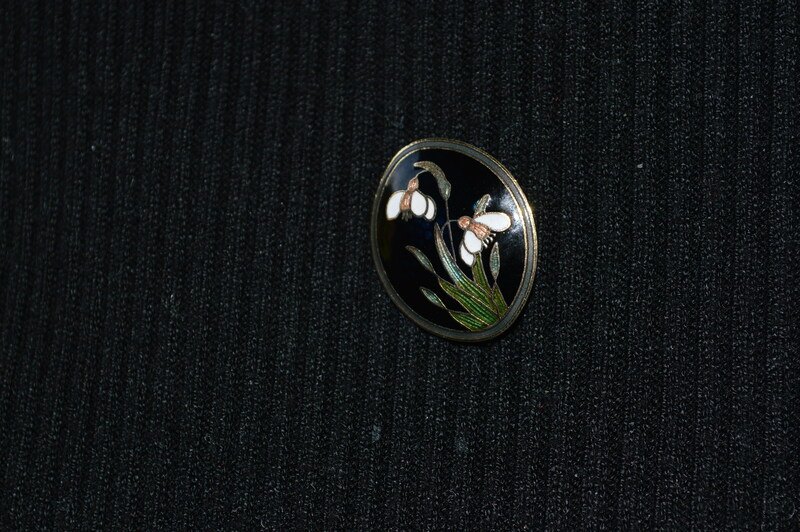 I even wear snowdrops on my bosom. 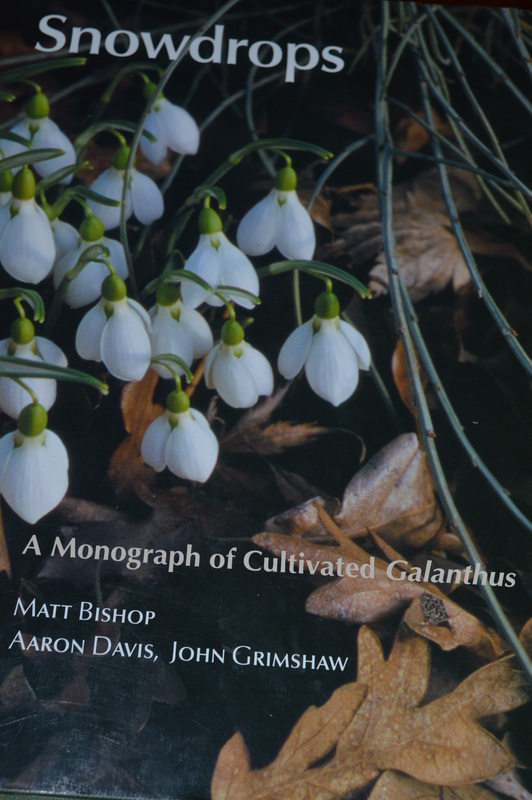 I spend hours with my nose in the snowdrop bible, the Matt Bishop monograph on Galanthus which I bought years ago for £36 and thought I was very extravagant. You now find it on Amazon for between £560 and £880. 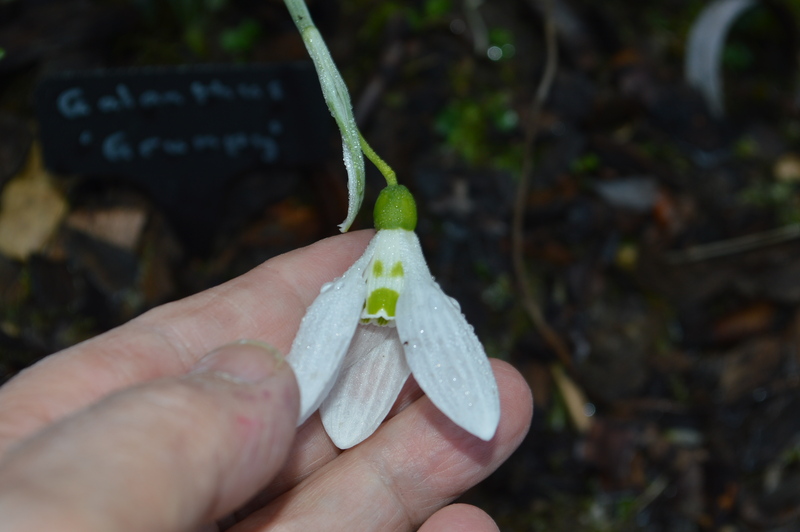 Yes, snowdrop enthusiasts really are mad. But then in the middle of winter what else is there for a plant fanatic to obsess about? Sitting by the fireside dreaming of roses is all very well but at some point you need to get outside and find something to enjoy. And snowdrops are exquisitely beautiful and if you think they all look the same, then look again. Here are a few more of my favourites. Perhaps you live in a country that doesn’t have weeks of cold grey skies or maybe like Reginald Farrer, you find looking at snowdrops gives you chilblains and you don’t feel the need to kneel on cold wet ground to peer up the chaste skirts of these snow white beauties. But you are missing one of the few horticultural pleasures of winter, specially if you can share it with like-minded friends. There is something special about a rare February day of sunshine when the birds have started to practise their trills and the buds are plumping up on the trees and you and your fellow snowdrop nerds bond together, exclaiming over yet more exquisite beauties. I know there are people out there who do not ‘get’ the fascination with snowdrops. They say beauty is in the eyes of the beholder but I am with the inimitable Miss Piggy when she said to Kermit: ‘Beauty is in the eyes of the beholder and it may be necessary from time to time to give a stupid or misinformed beholder a black eye’. I am not suggesting that any of my lovely blogging friends are stupid but if you can’t appreciate their beauty, put your coat on and go outside to have a proper look. 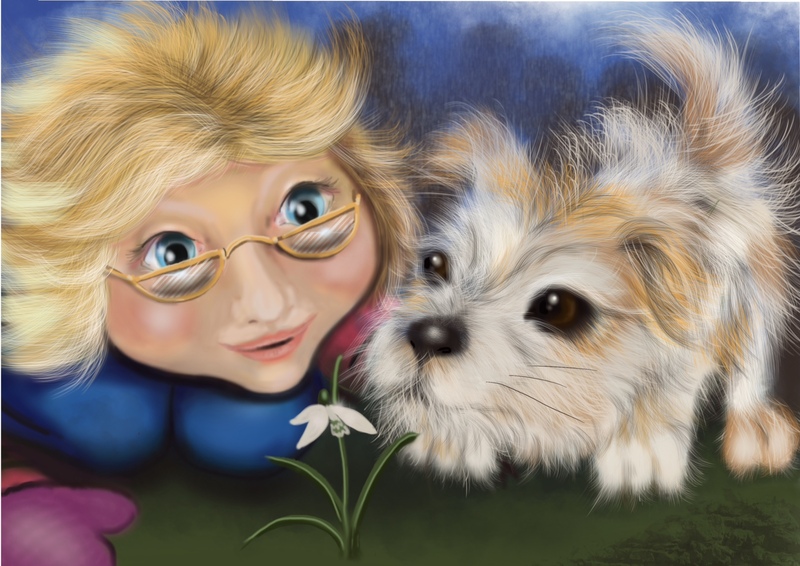 54 Responses to Galanthomania- Snowdrop madness. I’m with you all the way! I’ve been out checking on my snowdrops ever since some started flowering at the end of November! Every day more and more flowers open and now the wild singles have joined the party, it is wonderful out there. Oh yes Pauline, I know you are one of the club. I wish I lived near enough to visit and see your winter garden. Oh… how you make me laugh and dream and wonder at the same time ! Your snowdrops are gorgeous and, though I don’t grow them myself because they don’t seem to like my garden (and I am short of cash), I am very moved by their chaste beauty. Thank you for sharing them ! Thank you Frog, what a pity that your soil doesn’t suit snowdrops although it is probably better for your purse .Glad you liked them. Fascinating post and I didn’t have to leave the warmth of my room to see so many magnificent snowdrops. I planted my first ever ones last year ‘in the green’ and have yet to see any actual flowers, but I think there are leaves so hopefully some have established themselves. I doubt I shall become one of ‘the club’, not got a large enough garden for one thing, but I can appreciate their beauty. I do not see any discernible difference between ‘Two Eyes’ and ‘Grumpy’ though. The scented ones are attractive and of course the yellow ones. I hope your snowdrops will establish and give you pleasure in years to come. I thought the same thing about the Grumpy and Two Eyes photos. I must go and have another look at them in the garden tomorrow. Your snowdrops are just so cute and I never knew there were so many or some that were so expensive. I think you could write your own book. 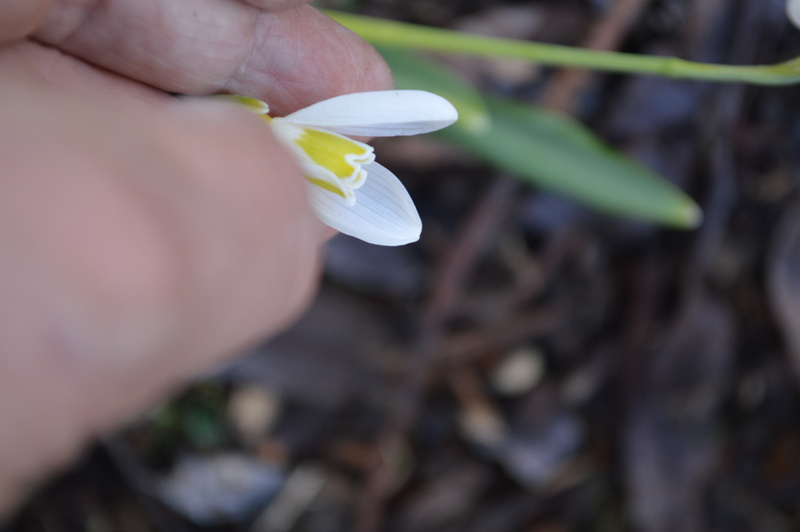 I thought I had Texas-sized snowdrops here in Texas, but I was corrected (by an British blogger, I believe) and mine are not snowdrops, but they give the same rush as an early sign of spring. Do you mean leucojums? They are called snowflakes here. I love the little Leucojum vernum which has a lovely little lampshade flower on a short stem. Leucojum aestivum has a long stem and smaller flower so is not as pretty. Yes. I believe I have L. aestivum, as according to the information I have, they make up to 6 flowers per stalk. I never thought I would have a blog and many plants I bought in the past I just planted and threw out the labels. The blog has been a learning experience for me. I have always liked taking photos of my plants and couldn’t find many people who liked to look at them. Blogging is perfect…people can look at mine and I can look at theirs and learn a lot. A great post. Your churchyard rescue was a great find. I love the yellow ones too, but I’m with Jude on ‘Grumpy’ and ‘Two Eyes’. Snowdrops draw us in so we end up thinking “I love the striped effect on the leaves”. Something about them makes us want to look closer. Thank you. 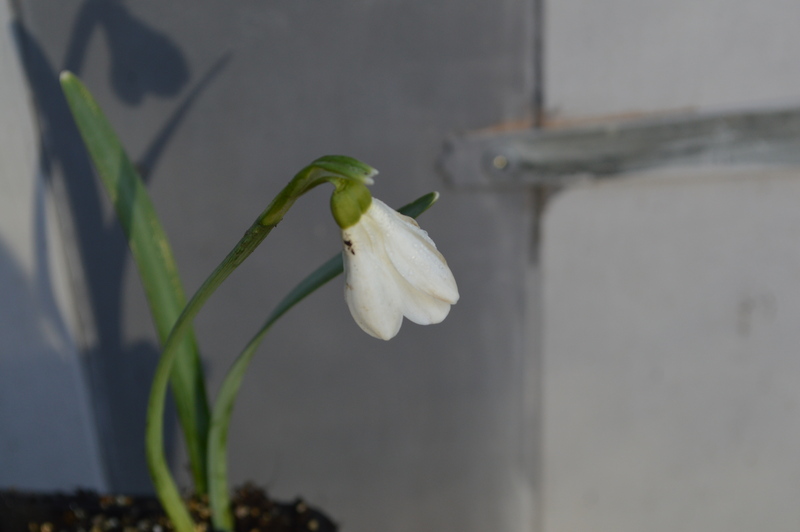 I hope my found snowdrop will come up the same next year, it is certainly different. 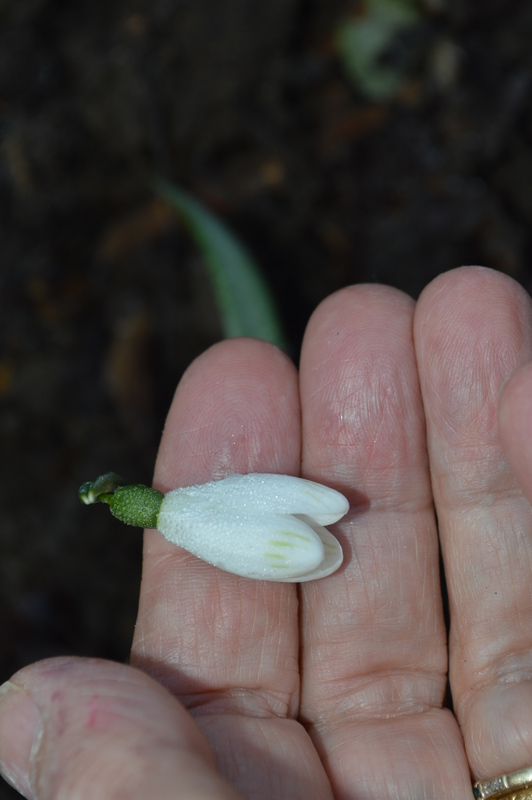 I once found a double- headed snowdrop which excited me, but it never happened again. I think we get so excited about snowdrops because there is not much else to drool over apart from hellebores. They certainly wouldn’t get the same attention if they bloomed in summer. Thank you Christina. I rather think you would be collecting snowdrops if you lived in England. I will bring you a few different ones and we will see if you become hooked. Chloris, I live in North Carolina, and I am a galanthophile. There, I’ve confessed! I found a G. nivalis with pale green strip on the outer petals at my back door bed several days ago. If it had the stripes last year, I don’t remember noticing them. I am elated! I dream of visiting England in snowdrop season. Thank you for posting this wonderful treat. It’s as sweet as the Pianist’s cakes. There should be a Galanthophile Anomynous society and we could all stand up and confess. Do you have a blog Martha? 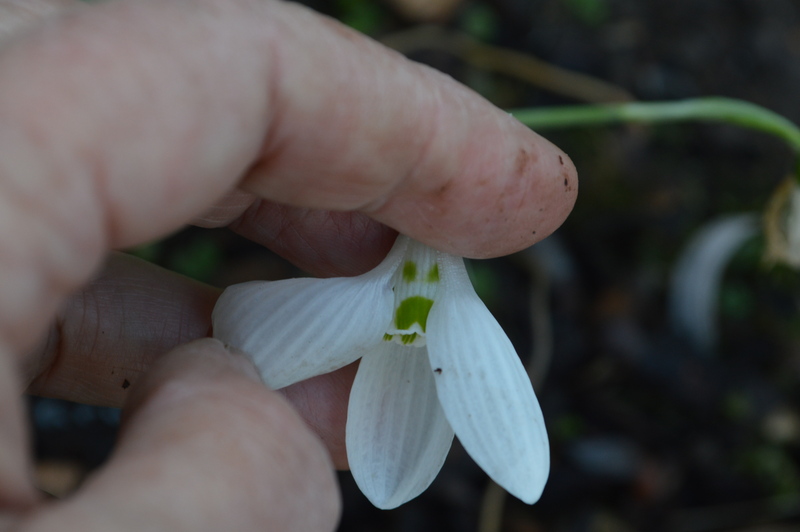 I would love to see a photo of your striped snowdrop. And you remember the Pianist’s cake? I will tell him. Although I don’t pretend to share your passion, I do enjoy seeing your collection. I’m sure that you are correct that if I lived where I could see and buy these special snowdrops I would become a collector too! Enjoy!!! I think you would become a collector if you lived in England. I will bring you a few different ones when I see you. You are a temptress! Thank you. Ha! I knew it when I read your post when you got back from your travels. I thought yes and next year we will be seeing a few more. Well of course you have to have ‘Jessica’. Wonderful collection. Mine is slowly growing, another four added this year. Thank you Helen. It is fun adding a few each year and watching your collection grow. I don’t think I have ever bought a snowdrop. But I love them. My garden is full of them and they have all come from a few that I dug up before moving house from my last garden, and those all came from some from my mother’s garden. I love them all but haven’t every paid attention to checking which variety they are. Well you are probably better off loving them and not looking too closely and then wanting or rather needing more and then more. Better for your sanity, better for your purse. I know you share my enthusiasm and I hope you are going to show us some of your snowdrops soon Anna. Favourite? 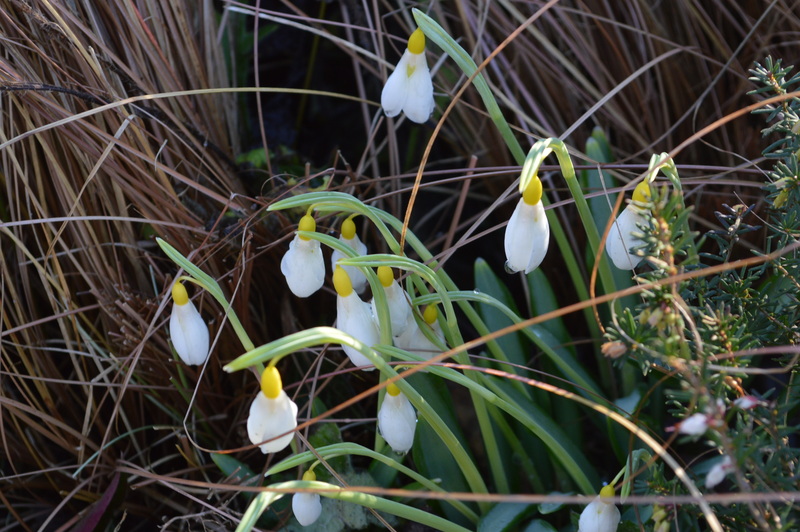 I share Farrer’s liking for Galanthus poculiformis and I love Diggory but it’s difficult to pick a favourite isn’t it? How about you? Your photos are all wonderful and I imagine you have to crawl around on all fours with your camera almost touching the ground to get such good shots! 😉 I admit I am no galanthophile, but I do think they are all very lovely markings and can admire them nonetheless. Thank you Cathy. Yes, you get wet knees peering at snowdrops and taking photos. I can see why some people like to keep them in pots. You have an impressive collection, Chloris. You must be in your glory right now! 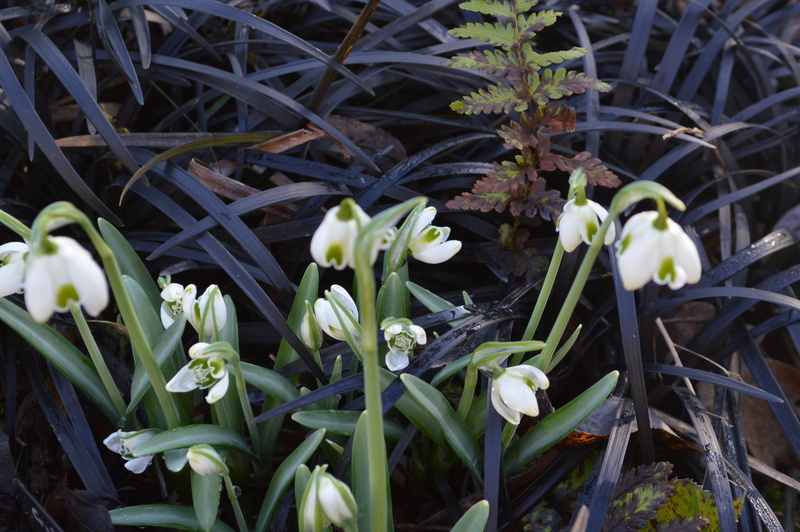 Yes, February is always an exciting time if you love snowdrops. You make it easier for me to understand the tulip mania in early 17th century Holland 😉 Actually, there’s little question in my mind that, were I to live in a climate such as yours, I’d be likely to succumb to snowdrops as well – I certainly have more Leucadendrons and Grevilleas than anyone needs. Yes, some of the prices remind me of the tulip madness. Let’s hope the bubble will burst and people who want to make money out of snowdrops will move on. Indeed you do have a wonderful collection of leucadendrons and grevilleas and succulents too. Sweet! You certainly have an impressive collection of Snowdrops. I have a few, but you’ve convinced me I need to add more! They are special! Are they expensive over there too? It is fun adding to your collection each year. Thank you, Chloris, I was wondering about the broad-leaves clumps I inherited with the garden. I love the little cross face! I can absolutely understand this obsession. The attention to detail is to be applauded. Snowdrops more than any other flower remind us to stop and look closely and just enjoy the wonder of nature. And they rescue us from winter. That is exactly it Ali. Having flowers to examine closely and enjoy in the depths of winter keeps us prowling round the garden and of course we notice other things too. But it is snowdrops and hellebores too that shorten the winter for me. You have a wonderful collection Chloris, I did have to read the sentence twice “I even wear them on my bosom”. The ones I brought here with us are spreading nicely through the garden with a little help each year. Yes, I popped the sentence in to make sure people were still awake. It is amazing how quickly snowdrops make carpets with a little help. 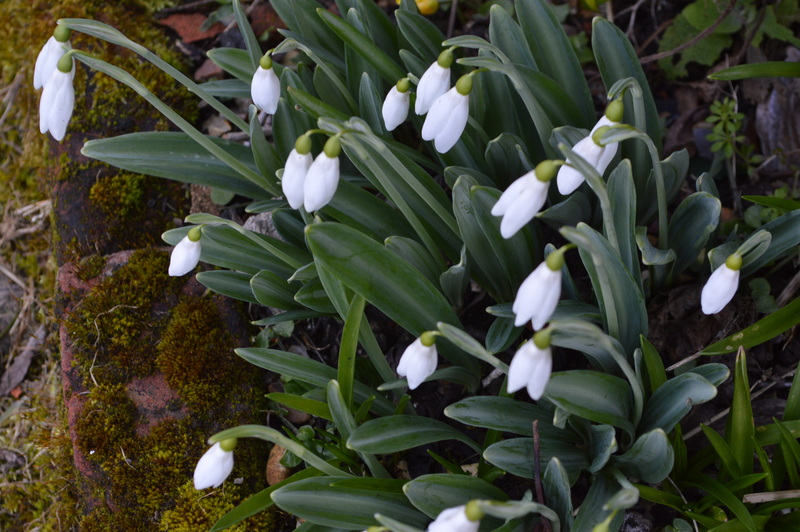 While gardening in Arizona it all seemed very safe to fantasize over my friends’ snowdrop posts each February. 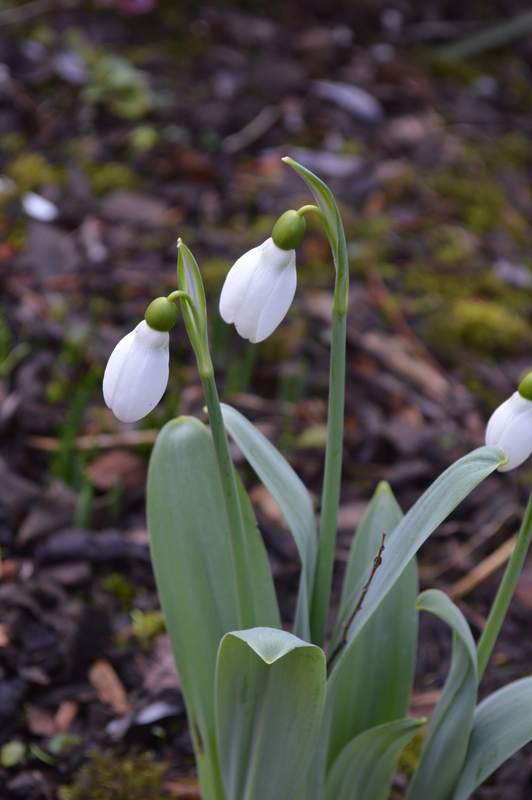 After all, my garden would be at its height at the same time, and I didn’t think any type of Galanthus would have much chance in the desert! I’m trying not to make too big a wishlist from your posts! There is the budget to consider after all! You don’t need snowdrops in the desert, I don’t think we’d give them so much attention if we had plenty of other flowers to enjoy in winter. But yes, in colder greyer climates they are a joy. 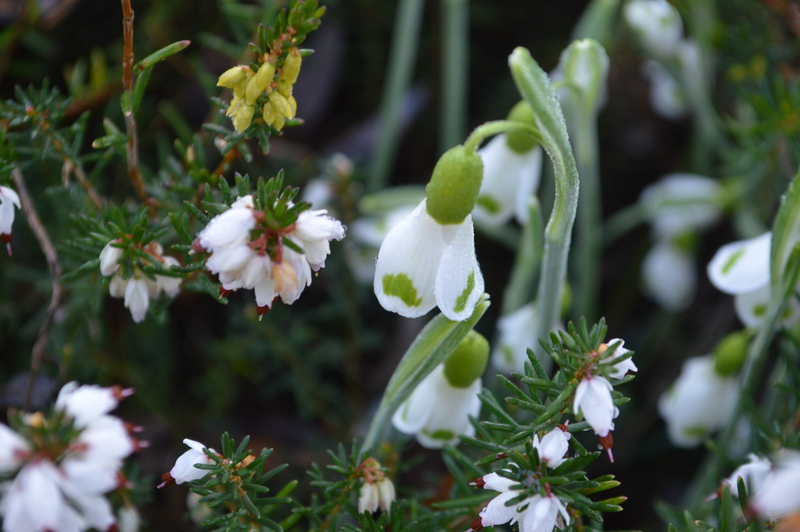 And S.Arnott is a good starter snowdrop, it has big flowers and spreads fast. I can absolutely understand your obsession with these fascinating and dainty flowers. I have only one- the slightly common ‘nivalis’ and it’s a very long way from forming a clump. It’s quite unsuited to our climate so it’s going to be an only one and I shall enjoy northern hemisphere galanthuses vicariously. I can imagine they wouldn’t suit your climate but then you have so much to enjoy that we can’t grow here. Ooh, I like ‘Madeleine’ with the little yellow necks. As for the church bathroom, it does seem unreasonable to mess with after all those centuries. Yes, Madelaine is a very dainty lady. Yes, all that trenching is awful and so many centuries old graves are being disturbed. ‘Not yet’? Seriously? I am immune! I will be satisfied with my snowflakes that just magically appeared on the riverbank. I do happen to be a sucker for the Gladiolus papilio that ‘Tangly Cottage Garden Journal’ sent to me, but they will not be blooming for quite a while. They are a summer bulb. Well I think anyone who loves in a warm climate with flowers all year would be immune to the icy charm of a snowdrop. I love Gladiolus papillio too, it has such a subtle colour. I like it because it is perennial; but I like it most of all because it was a gift from the writer of Tangly Cottage Gardening Journal. Thank you for your support Dorris, my rescue snowdrop is fascinating, it is actually cream rather than white. Maybe it will make my fortune. Or more probably it will revert to plain nivalis next year. Hoping it makes your fortune Chloris! My daily walk takes me through the churchyard and I can’t walk past snowdrops without looking at them. Yes I agree February is a wonderful month, specially when the weather is like it is today, sunny and mild. The painting was done by dear Beatrice a few years ago. She always flatters me by leaving out my wrinkles. Sadly dear little Pip is no longer with us but it is nice to remember sharing the garden with him. I knew I could depend on you to visit me in prison. But it would be nice if you would visit me one day in my garden.